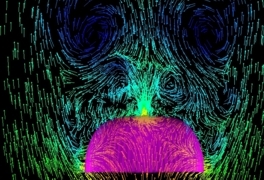 Here we focus on computer modeling of the fluid-structure interactions (FSI) involved in disreefing of a G-12 parachute. The parachute is initially deployed in a reefed configuration and with a lower drag area so that higher descent speeds are achieved during most of its descent. Prior to landing, it is disreefed to increase the drag area to its full level and thus reduce the landing speed to its normal value. We model the aerodynamic and FSI response of the parachute to the disreefing. 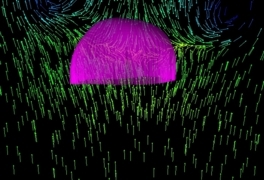 The simulation starts with a reefed parachute with a diameter 25% smaller than the diameter of a fully-inflated parachute. The simulation is carried out in a parallel computing environment with the parallel FSI solver written by the T*AFSM. The underlying methods of the FSI solver were introduced by the T*AFSM over the years. These methods include: the Deforming-Spatial-Domain/Stabilized Space-Time (DSD/SST) formulation [1-4], an automatic mesh update technique , and the quasi-direct fluid-structure coupling method [6-7]. Fig. 1. Snapshots of the G-12 parachute and the flow velocity as the parachute undergoes full disreefing. 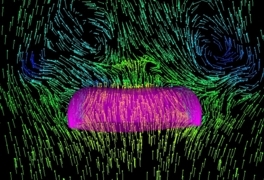 The velocity vectors are colored with the air pressure. Fig. 2. Time history of the G-12 parachute shape as it undergoes full disreefing. For more details on this simulation, see [8-9]. 5. T.E. 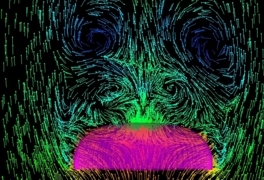 Tezduyar, M. Behr, S. Mittal and A.A. Johnson, "Computation of Unsteady Incompressible Flows with the Stabilized Finite Element Methods--Space-Time Formulations, Iterative Strategies and Massively Parallel Implementations", New Methods in Transient Analysis, PVP-Vol. 246/ AMD-Vol. 143, ASME, New York (1992) 7-24. 6. T.E. Tezduyar, S. Sathe, R. Keedy and K. Stein, "Space-Time Techniques for Finite Element Computation of Flows with Moving Boundaries and Interfaces", Proceedings of the III International Congress on Numerical Methods in Engineering and Applied Sciences, Monterrey, Mexico, CD-ROM (2004). 7. T.E. 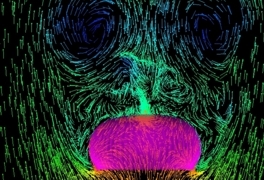 Tezduyar, S. Sathe, R. Keedy and K. Stein, "Space-Time Finite Element Techniques for Computation of Fluid-Structure Interactions", Computer Methods in Applied Mechanics and Engineering, 195 (2006) 2002-2027. 8. T.E. Tezduyar, S. Sathe, M. Senga, L. Aureli, K. Stein and B. Griffin, "Finite Element Modeling of Fluid-Structure Interactions with Space-Time and Advanced Mesh Update Techniques", Proceedings of the 10th International Conference on Numerical Methods in Continuum Mechanics, Zilina, Slovakia, CD-ROM (2005). 9. T.E. 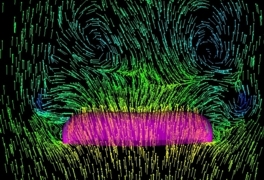 Tezduyar, S. Sathe, K. Stein and L. Aureli, "Modeling of Fluid-Structure Interactions with the Space-Time Techniques", Fluid-Structure Interaction (eds. M. Schafer, and H-J. Bungartz), Lecture Notes on Computational Science and Engineering, Springer, in press (2006).